Instagram users are inspiring each other to be healthy, while also fostering a body positive movement. Let 2015 be known as the year Instagram rose to the forefront of social media as an “engagement engine.” Sure, it’s largely due to the power of visual media and the talent of social media creatives. However, Instagram’s high engagement could also be attributed to the ability of users to connect with and develop communities of like interest. Case in point: the thriving fitness communities on Instagram, which include yoga, running, functional training, and bodybuilding, among others. And some of the most influential Instagrammers driving these communities are fitness professionals: like Jessamyn Stanley, a yoga teacher who has become a poster child for body positive yoga. Or Natalie Jill, the fitness trainer and life coach who built her entire business on a foundation of social media influence. Instagram has even become a weight loss support group of sorts, where users chart their journey with before-and-after photos, tips and other “finspiration.” There even seems to be an Instagram Weight Watchers revival in the works. Through their phones and tablets, dieters have created a supportive and open community not unlike the company’s famous weekly in-person meetings. While Weight Watchers’ official Instagram account has 234,000 followers, the #weightwatchers hashtag has 2.2 million entries as of this writing, and others like #wwsisterhood and #wwinspiration have 620,000 and 65,000, respectively. 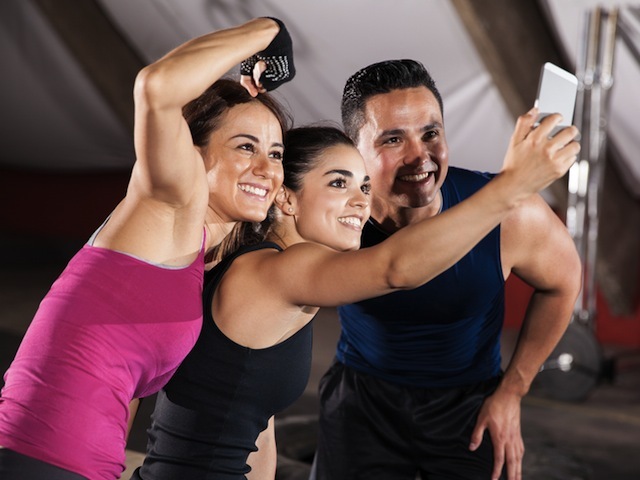 Indeed, there are plenty of Instagram fitness success stories and the workout streaming service Daily Burn even provided a list of some of the most inspirational Instagrammers. Of course, the list was a mix of fitness pros and brands including Nike and TeamUSA. The whole reason that I even started blogging was because I wanted to track my yoga practice, and it’s much easier to do that if you take photographs of your body. And it’s also a lot easier whenever you practice yoga to practice in either not a lot of clothes…So I started posting photographs of myself kind of scantily clad, and that had a resonating effect for people. Similarly Kristine Strange joined Instagram for accountability and community support once she committed to losing weight and getting healthy. Roxie McGillberry is yet another Instagram fitness sensation who used Instagram to share her journey and inspire others. As I started losing weight, I used my Instagram account to post photos of me working out and cooking. Over time, my feed started to gain a ton of followers. Now, I have more than 8,000 and use @Roxi_Fitness to provide fitspiration. This all points to a growing crop of fitness influencers on the site hailed as having the most engaged users. And these users are inspiring each other to be healthy, while also fostering a body positive movement.